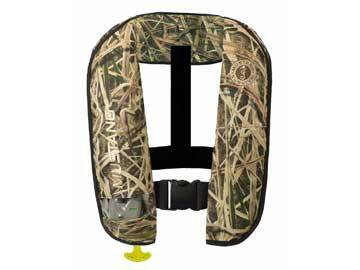 MD2016 02 CM - When inflated, the M.I.T.™ 2016 boasts 26 pounds (lbs) buoyancy. The MD2016 also features an inflator inspection window and access flap to make inspecting and maintaining your PFD easy. Membrane Inflatable Technology M.I.T.™ is a brand new inflatable technology used exclusively in Mustang Survival's next generation of inflatable PFD's. By using less fabric and lighter weight components in this design the MD2016 provides an overall lighter, more flexible and comfortable fit. MD2014 02 CM - A premium product at an affordable price, the all new MD2014 02 M.I.T. 100 was designed with style. 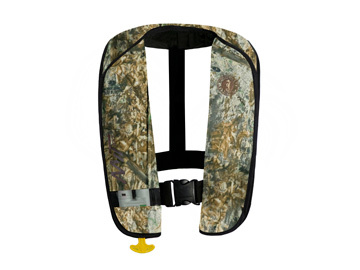 This easy to wear and easy to use manual inflatable PFD features Mustang Survival Membrane Inflatable Technology™ inside to reduce product weight and create a lighter and more flexible fit. MD2014 02 CM is available only in Mossy Oak® Shadow Grass Blades®. Picture shown is Mossy Oak® Duck Blind® which is not available. MC1504 CM - Made for hunters and anglers, Mustang Survival Hunting and Fishing Gear is designed with Mossy Oak® Duck Blind® camouflage print to blend in with any marsh or wetland setting to keep you well-hidden. Most importantly, Mustang Survival Outdoor Gear is made with AirSoft™ foam for a soft and comfortable fit to keep you warm and dry, keep you afloat, and protect you against the onset of hypothermia if you ever find yourself in icy cold water. 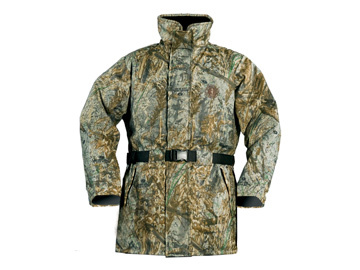 This Sportsman Coat is an unbeatable value. Discontinued - Limited stock. 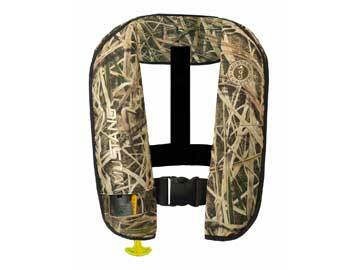 MV3565 - An excellent all-around PFD for older children who no longer need head pillow support (or stubbornly refuse to use it). MV3570 CM - Ultra soft fabric resists stains, and segmented foam flexes to keep kids moving. 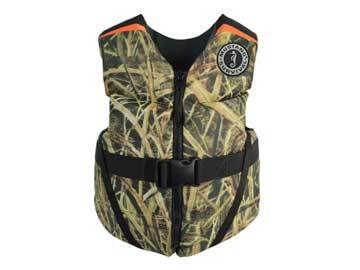 Built for a serious fishing mission, this vest is as versatile as its owner. MD3087 - Made for recreational enthusiasts and professionals alike, the MD3087 automatically inflates when the wearer is immersed in water and is lightweight and close fitting to ensure it doesn't interfere with regular activities. Discontinued - 1 left in stock.